We are getting close…really, really close…within striking distance of obtaining justice. On April 18, 2017, Tarrant County Criminal District Attorney Sharen Wilson’s Conviction Integrity Unit began reviewing Roy’s case; completion expected within 90-180 days. EXONERATE TODAY!!! – WHY IS 90-180 DAYS NEEDED? All it takes is for the Conviction Integrity Unit to review Euless Police Officer Ramsaur’s testimony and her police car videotape. Exoneration!!! In 2016, I contacted Ramsaur with hopes that she would have second thoughts about her trial actions. She responded with, “I will not change anything that I have said or done in regards to your son’s case. (see complete letter) There was nothing inappropriate about the video tape. “…a life-long Republican, an award-winning judge, conservative law professor, and longtime Sunday School teacher. While serving as Tarrant County’s 14th Criminal District Attorney, Wilson holds fast to the highest ethical standards. The matters that you have brought to our attention do not warrant the initiation of an FBI investigation. The FBI's Dallas Division has also reviewed this matter and determined that no action is warranted. My name is Laura Adams-Jenkins. I seek justice for my 38 year old son, Roy Adams, Jr.
January 1, 2017 marked the beginning of the 12th year our son has spent in a Texas prison after a jury found him guilty in August 2005 of intoxication manslaughter in the 2004 death of Grapevine Police Officer Darren Medlin. 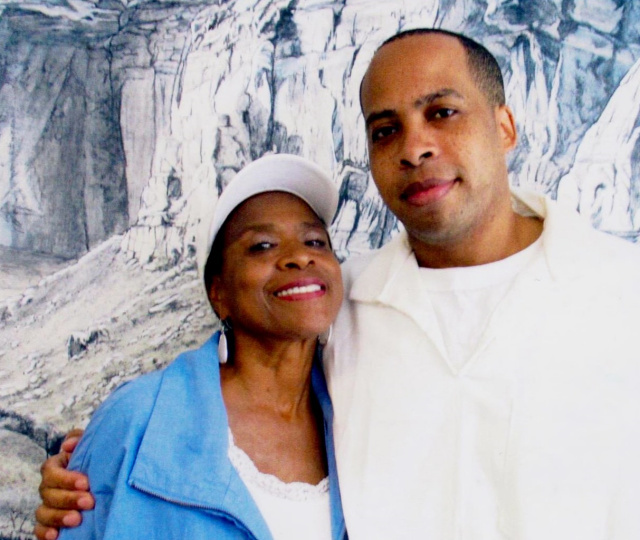 Our son was sentenced to 12 ½ years in prison, he continues to be denied parole. Without diminishing our condolences to the Medlin family in any way, our son was not drunk driving. We see his pain, anguish and sorrow each time we look at his police station interrogation conducted immediately following the accident and prior to being taken to the hospital for his blood draw. a. Why did Prosecutor Richard Alpert redirect our son’s blood draw from the Texas Department of Public Safety lab to the Tarrant County Medical Examiner’s lab where it shows up as a .11 BAC? Was it because of expediency? According to the blood draw nurse, the hospital could have provided results within a couple hours. b. What happened to the critical video from the dashcam of the first police officer to talk to my son? Officer Ramsour said she always turns off her dashcam when she arrives at traffic stop and used the term "MUSCLE MEMORY". Dash Cam from Euless Police Officer Ramsour on Vimeo. NOTE: Her arrival at my son and his car occurs near the end of the video. If you start the video at 3:30 minutes, you will see all the key video footage. Almost 5 years after the trial, we hired a forensic audio/video expert who provided the answer: “… found indications of "tampering or deletions" after examining the tape. The 17 seconds delay in deactivation of the recording is inexplicable from a technical standpoint because the tape should have been deactivated within two seconds had the events transpired as testified by Officer Ramsour." c. If our son was drunk, why did the blood draw nurse, an eyewitness to the accident, and Officer Medlin’s partner report no observable indications of intoxications in their testimonies? d. Why was the police station video of our son not shown in court? According to Randy Schaffer, the attorney we hired to file a writ of habeas corpus, “Roy looked good on the videotape…the jury saw how good Roy looked at the station but his blood test result was well over the legal limit.” Randy was wrong; Our former Lawyer of the Year trial attorney, Michael Heiskell did not show this video in court. Heiskell is a 2017 Director in the National Association of Criminal Defense Lawyers and recently recognized in “Texas Lawyer” as one of the “Extraordinary Minorities in Texas Law.” Again, why? Continue to pray for our son and all the others imprisoned (wrongfully or not). you care they are a human being and not a commodity. Laura Adams-Jenkins and Roy Adams, Sr.